Book cover image supplied by and courtesy of Crowood Press. 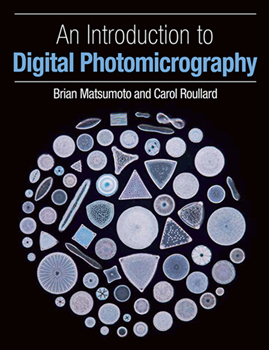 An Introduction to Digital Photomicrography by Brian Matsumoto and Carol Roullard. Paperback / Kindle. ISBN 9781785003042. Publisher - Crowood Press (UK). Publication date May 2017, 110 pages, 74 figures mostly in colour, 11 tables. Size ca. 25 x 19 cm. UK: Paperback - Amazon £16-99, Amazon Marketplace £9.24, Kindle £8.54. US: Amazon $32.95, Kindle $10.88. Amazon offers a 'Look Inside' feature. The publisher's website also offer a selection of page scans. This attractively presented book on the rear cover notes that it is "written for the hobbyist and neophyte who wants to take pictures through the microscope". One of the authors Brian Matsumoto has previously written Practical Digital Photomicrography (published by Rocky Nook in Jan. 2010) which was reviewed on Micscape by Spike Walker. The earlier book was aimed at a wider audience including professionals. Both the authors of this recent book are experienced photomicrographers (the cover remarking that they have over 60 years experience of photomicrography between them). They have also co-authored a number of books on digital camera models in the Panasonic and Sony range. Carol Roullard's website notes that she specialises in polarised studies of microcrystals. Brian Matsumoto maintains a website MatsuImaging. Not surprisingly the coverage of the two books is similar in many respects. Although the new book is slimmer (110 pp cf 184 pp), the tighter margins and more modest image sizes may bring the content to almost comparable. The production quality is again to a high standard with the new publisher. As the authors note, high quality photomicrography requires a good understanding of how the compound microscope works and its correct setting up for various optical and image enhancement techniques and the first three chapters (ca. about one third of the book) are devoted to these topics, providing a clear and well illustrated discussion. For the established microscopist just seeking advice on venturing into digital photomicrography, much of this first part covers topics that should be very familiar. A brief discussion on the modern form of 'Köhler illumination' and how the setting up differs from the traditional may have been worthwhile as it's a potential source of confusion for the beginner (see Footnote). Since the earlier book was published, a number of features have become increasingly available in consumer digital cameras of value to the microscopist. These include the use of electronic first curtain shutters (to help minimise vibration) and the option on still cameras to capture video—often up to broadcast quality, some offering the new 4K and similar standards. One of the most useful features of the book is that it allows these new features to be covered and a chapter is devoted to video microscopy. The demanding requirements placed on the computing hardware is emphasized if wish to use the highest resolutions / frame rates. There's a good discussion of potential sources of vibration, its likely causes and the role of new camera features to minimise camera vibration. Dedicated microscope cameras are also covered and their relative merits cf. consumer cameras. Cellphone camera use is also discussed. Digital techniques such as stacking and stitching are not covered. The discussion concentrates on the use of compound microscopes rather than stereos or macroscopes. Although the benefit of using external large screens for critical focussing is mentioned (e.g. an HD TV screen), there was no mention of the remote control software offered free with Canon DSLRs and an option to purchase with Nikon models (plus third party packages). These packages are invaluable to many photomicrographers, including myself, with the benefit of full camera control as well as critical composition / focussing, auto-transfer of the image file to the PC thus avoiding the need of a card and with immediate review of the captured image. The software is also useful when stacking / stitching. Optical microscopy and photomicrography are vast topics (a two volume monograph has been published on the latter topic alone) and judging the ideal balance for the beginner in a slim volume can be challenging. Although most topics are covered, my feeling is that the balance could have been better for the beginner. Brightfield, phase and darkfield are well covered and two more specialised techniques, DIC and fluorescence are also discussed (DIC often prohibitively expensive for enthusiasts). But some techniques readily available to the beginner at little cost have been omitted i.e. oblique, Rheinberg and qualitative polarisation studies. (Spike Walker also noted these omissions in the earlier book). Oblique by using either simple card stops in the filter tray, at field lens or the use of off-axis phase plates can offer significant improvements for low contrast subjects, such as the epithelial cells illustrated. Polarisation studies using crossed filters and simple tint plates are one of the delights of optical microscopy, both to beginner and established worker alike, costs very little and particularly suited for photography. The omission of the topic is surprising given that this is a specialty of one author and also the attractive full page frontispiece image is of microcrystals taken using crossed polars. Summary. With a street price new of less than £10 from some outlets, this latest book with its high production standards and engaging yet authoritative presentation by the two authors is excellent value. It provides an overview of key aspects of microscopy and photomicrography including the use of recent features increasingly offered on digital cameras. One of the author's earlier book Practical Digital Photomicrography was originally much higher priced but now available new for a similar price ($15 on ebay.com). For the enthusiast seeking one of the two, the latest may be preferred because it brings up to date a fast moving topic and more aimed at the hobbyist. Thank you to Julie Sankey, Sales Office Manager at Crowood Press for kindly offering a review copy and for the image of the book cover. Comments to the reviewer David Walker are welcomed. An aspect of lighting that may have been of value to expand upon, as I suspect it may confuse the beginner, is the use of the term Köhler illumination by modern microscope manufacturers. It's often used if a field iris is featured but does that qualify it necessarily as having Köhler? One of the microscopes illustrated and widely available used, the Nikon S, would have the traditional set up procedure familiar to established hobbyists i.e. the careful focussing of the visible lamp filament on the condenser iris plane and again visible at the back focal plane of the objective. This procedure is not discussed in the book. If the beginner invested in a modern microscope instead of a used older model, there is invariably no visible filament and requires a simpler setting up that the book does describe. Of the various modern microscopes up to mid research level standard handled by myself and my brother, one if not two diffusing elements are typically included permanently and often placed much further up the optical light chain rather than the old practice of being near the bulb. (Some older microscopes provided diffusers as an option to swing in, others frosted the bulb.) The extensive use of diffusers can noticeably effect bulb efficiency, a key benefit of true Köhler. Is this modern approach still Köhler illumination or more akin to Critical / Nelsonian? I'm uncertain and judging by the long threads sometimes seen in microscope forums it remains a confusing issue with others. Published in the July 2017 edition of Micscape.